(From Sigma lens literature) This compact high magnification zoom covers a wide focus range from wide angle 28mm to 135mm tele-photo, and macro. A triple-cam inner focus system achieves high performance in a compact lens body. Equipped with a tele-macro mechanism for close-up photography at 135mm, it has a maximum reproduction ratio of 1:2. Ideal for travel and snapshot photography simply by switching a selector and setting the zoom ring at 135mm. 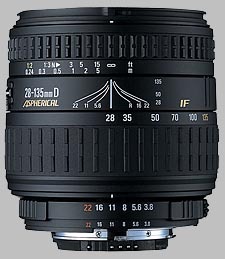 An aspherical lens effectively compensates distortion as well as all types of aberration and creates high image quality at all focal lengths. An inner focus system provides high performance and convenience. The non-rotating lens barrel perfectly suits the matched petal shaped lens hood. This was a great lens for me for four years. It was a great walkaround lens, going from fairly wide to moderate telephoto, and then easily to 1:2 close-ups. I'm just a hobbyist doing small prints, so I saw no image quality problems. It did break twice during the four year warranty (once the focus ring locked up and once the aperture wouldn't stop down), but both times Sigma quickly fixed it and got it back to me.